DRUMKEERAN HOUSE ON IVEY LAKE, PEMBERTON, B.C. 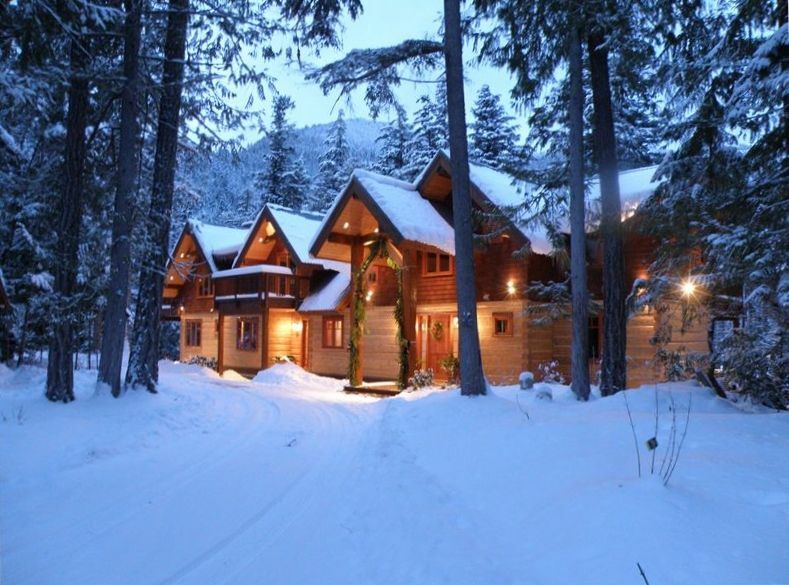 Designed by leading architect, Ted Murray, and built by local log builders and craftsmen, Drumkeeran House is a classic example of the revival of the use of square-cut dovetail chinked logs hewn from British Columbia’s massive Western Red Cedars. Strikingly set on the headland point of Ivey Lake, a trophy fly-fishing lake, the private five acre estate of Drumkeeran is blessed with a stunning and unforgettable country location. The estate lands boast over 800 feet of waterfront with private dock and are richly forested with mature fir, cedar, hemlock, pine, birch, maple and wild dogwood. Local wildlife abounds and you may see black bear, mule deer, rabbit, squirrel, chipmunk, eagles, hawks, ducks, woodpeckers, a profusion of songbirds and, of course, fish. A small house on the property, Ardbeg Cottage, is the home of a full-time caretaker/concierge to take care of the house and grounds and ensure that every need of the guests at Drumkeeran House is looked after. Accommodation for up to 14 persons in six ensuite bedrooms, each with their own lake or forest views, and a sofa bed loft. Three bedrooms qualify as master bedrooms, each with their own lake view decks. A second vaulted family recreation room with wood-burning stove, 3D HDTV system, bar and additional kitchen. Winter activities include cross-country ski-ing, heli-skiing, snow mobiling, ice climbing and snowshoeing.Downhill skiing and snow boarding at Whistler (45 minutes to the ski-lifts). The lakeside setting gives guests the opportunity to take advantage of the fact that Ivey Lake is the only trophy fly-fishing lake in the Lower Mainland area of British Columbia. In addition, Drumkeeran House provides ideal quarters from which to set out and fish literally dozens of nearby rivers and lakes. The owner of Drumkeeran House, Maureen, and her husband David warmly wish all guests to their superb log lodge - 'Ceud Mil Failte - A hundred thousand welcomes' - and hope that they will have a wonderful stay in the mountains, lakes and rivers of the beautiful Pemberton Valley. WE ACCOMMODATE FAMILY AND FRIENDS GATHERINGS, SMALL RETREATS, AND SIMILAR OCCASIONS. SORRY - NO STAGS, STAGETTES OR OTHER NOISY EVENTS. We should come back again! We were a group of 6 families with little kids (0-2 year) and stayed at Drumkeeran for a couple of days in March 2019. The place has all you need for having an enjoyable stay. The kitchen is full of different types of appliances and utensils. The bar is also equipped with all you need and you don't really need to bring anything extra with yourself. The house is like a museum of varying pieces of arts from painting to sculptures to rugs. The caretakers were very approachable and responsive to the guest requests. We had an early check-in and it was done smoothly. Although the owners have tried to provide drinkable water in 3 places in the house, if you are so sensitive about the tases, I would recommend bringing bottled water with yourself. Just to clarify (because it is not so much clear from the description), there are 3 bedrooms in the ground level floor, 3 bedrooms in the upper level a big bedroom (with 2 kings bed) in the lower level (basement) so 7 small families could be accommodated easily. One thing that we were worried about was whether the place is baby safe or not (because we had some little babies) but we found it totally safe for the babies too. We had a small gathering of friends to celebrate a 40th birthday and this house was PERFECT. Amazing view, lovely owners and caretakers. Enough space for everyone to have their own room plus a full kitchen AND a kitchenette in the bar, which was perfect for when we all wanted to bake pies for the party! We had an amazing time here -- we hadn't even left yet and we were already plotting how to return. Amazing stay at a special place! Ten of us stayed three nights at Drumkeeran House for a company retreat. The house itself had absolutely everything we could need. It was amazingly clean and well stocked. The new hot tub was awesome and provided beautiful snowy views of the lake and mountains. The house's location was also great and allowed easy access to Pemberton and hiking spots; however, it was still far enough away from town that it felt very private. Lindsey the caretaker was unbelievably helpful and was readily available for questions throughout our stay. She also had suggestions for things to do in the area. Our favourite things about the house were the beautiful fireplaces, the open kitchen and bar area, the heated floors in the bathrooms (! ), and the comfortable bedrooms. We also had to do very minimal clean up, which made for an easy departure. I would highly recommend this house for a getaway of friends or colleagues. Thank you for everything! A very beautiful,comfortable and well kept home. Decorated so beautifully for the holidays.The caretaker was always available to answer any questions or concerns we had. We were well cared for. Thank you for the opportunity to stay at Drumkeeran House. We were truly blessed. The home is truly amazing and fit our family needs perfectly. The four king beds each had own full bath and instant hot water. The other rooms also had onw full baths. Kitchen was fully equipped. The hot tub was perfect and the grounds exceptional. The caretaker was lovely and made sure all was well. Would highly recommend to anyone. We hosted our families from abroad, and held our small wedding reception here. We could not have been happier with the accommodations and location. Isolated, but yet only 20 min to liquor/grocery stores in Pemberton. Less than an hour to Whistler. We couldn't ask for anything else. We got multiple compliments on our reception, the care taker Lindsey was very helpful, making extra beds and taking out trash daily.